We can add vectors mathematically using trig functions, the law of cosines, or the Pythagorean theorem. If the vectors to be added are at right angles to each other, we would assign them to the sides of a right triangle and calculate the sum as the hypotenuse of the right triangle. We would also calculate the direction of the sum vector by using an inverse sin or some other trig function. Suppose, however, that we wish to add two vectors that are not at right angles to each other. Let’s consider the vectors in the following images. We know that vectors in the same dimension can be added by regular arithmetic. Therefore, we can resolve each of these vectors into components that lay on the axes – pictured below. We can resolve each of the vectors into two components. The components are on the axes lines. 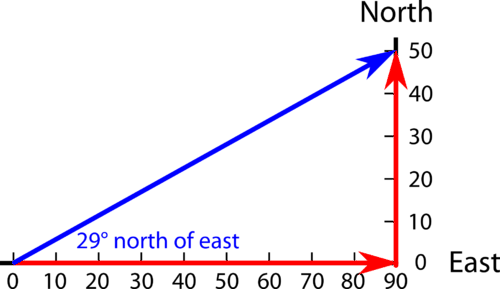 The resolution of vectors reduces each vector to a component on the north-south axis and a component on the east-west axis. We can now mathematically determine the magnitude of the components and add then arithmetically because they are in the same dimension. Once we have added the components, we will once again have only two vectors that are perpendicular to each other and can be the legs of a right triangle. We can now consider those two vectors to be the sides of a right triangle and use the Pythagorean Theorem to find the length of the hypotenuse and use a trig function to find its direction. The direction of the sum vector is 74 N at 58° north of east. Perpendicular vectors have no components in the other direction. For example, if a boat is floating down a river due south, and you are paddling the boat due east, the eastward vector has no component in the north-south direction and therefore, has no effect on the north-south motion. If the boat is floating down the river at 5 miles/hour south and you paddle the boat eastward at 5 miles/hour, the boat continues to float southward at 5 miles/hour. The eastward motion has absolutely no effect on the southward motion. Perpendicular vectors have NO effect on each other. 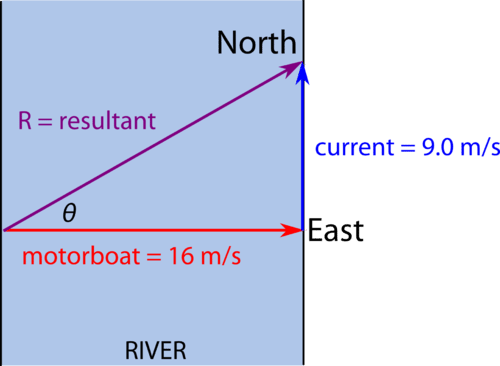 Example Problem: A motorboat heads due east at 16 m/s across a river that flows due north at 9.0 m/s. (a) What is the resultant velocity of the boat? (b) If the river is 135 m wide, how long does it take the boat to reach the other side? (c) When the boat reaches the other side, how far downstream will it be? (a) Since the two motions are perpendicular to each other, they can be assigned to the legs of a right triangle and the hypotenuse (resultant) calculated. The resultant is 18 m/s at 30° north of east. (b) The boat is traveling across the river at 16 m/s due to the motor. The current is perpendicular and therefore has no effect on the speed across the river. The time required for the trip can be determined by dividing the distance by the velocity. (c) The boat is traveling across the river for 8.4 seconds and therefore, it is also traveling downstream for 8.4 seconds. We can determine the distance downstream the boat will travel by multiplying the speed downstream by the time of the trip. Vectors can be added mathematically using geometry and trigonometry. Vectors that are perpendicular to each other have no effect on each other. Vector addition can be accomplished by resolving into axial components those vectors that are to be added, adding up the axial components, and then combining the two axial components. A video demonstrating the component method of vector addition. A hiker walks 11 km due north from camp and then turns and walks 11 km due east. What is the total distance walked by the hiker? What is the displacement (on a straight line) of the hiker from the camp? While flying due east at 33 m/s, an airplane is also being carried due north at 12 m/s by the wind. What is the plane’s resultant velocity? Two students push a heavy crate across the floor. John pushes with a force of 185 N due east and Joan pushes with a force of 165 N at 30° north of east. What is the resultant force on the crate? An airplane flying due north at 90. km/h is being blown due west at 50. km/h. What is the resultant velocity of the plane? 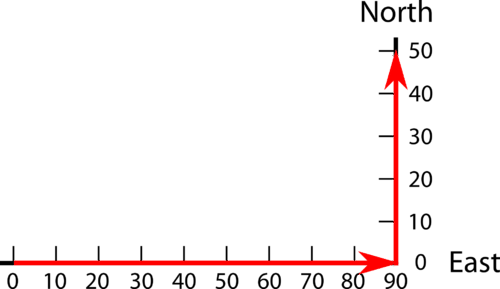 A golf ball is struck with a golf club and travels in a parabolic curve. The horizontal distance traveled by the golf ball is 240 meters and the time of flight is 4.00 seconds. What was the initial velocity magnitude and direction?